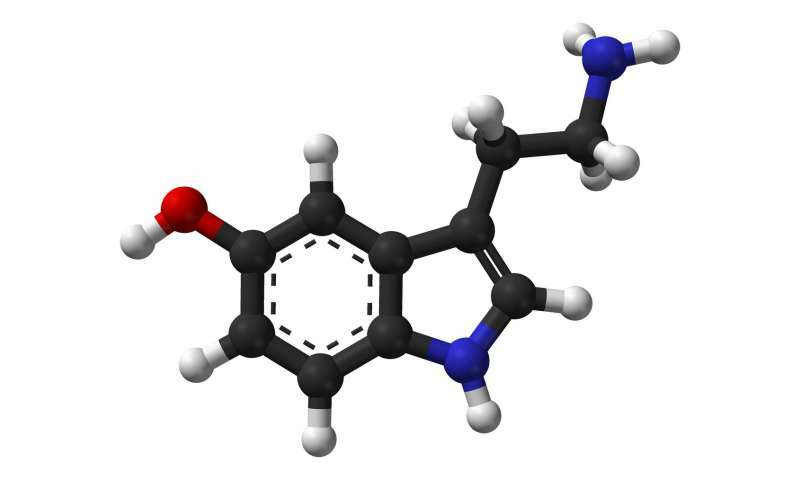 Researchers at UCLA and Columbia University have developed a novel method for tracking the activity of small molecules in the brain, including the neurotransmitters serotonin and dopamine. Pairing tiny artificial receptors with semiconductor devices that are able to function in living tissue, the team was able to observe brain chemicals at a high level of detail. The research, published in the journal Science, is part of the BRAIN Initiative, a large-scale collaboration among government, private industry, nonprofits, and numerous colleges and universities. "Understanding the fundamentals of how neurotransmission occurs will help us understand not only how our brains work, but what's going on in psychiatric disorders," said Andrews. "In order to move forward with dramatically better treatments, we need to understand how we encode information about anxiety or mood—processes that can go awry, sometimes with devastating consequences." "The idea for this project began 20 years ago," said lead researcher Anne M. Andrews, professor of psychiatry and chemistry at UCLA. "It was born out of a critical need in my own research on serotonin. My group was using state of the art in vivo monitoring—but it became apparent to me that improving the methods in hand wasn't going to be enough to provide the necessary resolution. We needed a totally new sensing strategy." This led to collaboration with Paul Weiss, professor of chemistry and materials science at UCLA. Andrews envisioned coupling artificial receptors with a nanoscale signaling platform. A major hurdle, however, was that the required transistors, which are basic units of computers and cell phones, and are needed to process a signal, don't work well in wet, salty environments. "The workhorse of any transistor is the semiconductor," Andrews said. "But when you put it in salt water, the salt ions—charged atoms—line up on the semiconductor surface, and shield it, preventing detection of electric field changes. The question was, 'How can we tap into the powerful science and sensitivity of existing transistors to use them in high-salt environments like the brain?' " A collaboration with Yang Yang, a professor of materials science at UCLA, provided the team with high-performance nanoscale semiconductor materials. Looking to nature is sometimes more effective than devising totally new methods, Andrews said. So she teamed up with professor Milan Stojanovi? and Dr. Kyung-Ae Yang, both of Columbia, who were using nucleic acid sequences as receptors. An advantage of these biomolecules is that they are smaller than bulkier protein receptors used by native cells and other investigators for biosensors. "Our breakthrough was that we used a different kind of receptor that was biologically inspired—after all, life began with RNA," Andrews said. The Columbia investigators develop nucleic acid sequences that act as receptors, called aptamers, which are small enough that some part is close to semiconductor surfaces. And in this, we've overcome the 'salt shielding' problem." In the new paper, the team successfully identified and tested receptors for serotonin, dopamine, and glucose. The receptors were found to be extremely selective, binding only the molecules they were designed to bind. The system was successful even in living brain tissue from mice. The method is universal, so it can be used for almost any target—to learn, for instance, how drugs change with time in the brain or other organs, how blood pressure is regulated, and how signaling molecules associated with the gut microbiome ebb and flow. Andrews' main interest still lies with neurotransmitters. "We don't currently have methods to study neurotransmitter signaling at the scales over which information is encoded," said Andrews. "So these sensors will allow us to approach critical dimensions. One goal is to ultimately figure out how brains process information through different neurotransmitters." The findings have implications not only for observing how neurochemicals act under normal conditions, but also in understanding psychiatric conditions like depression and anxiety. The team is now testing the strategy to watch neurochemicals in the brains of behaving animals.